I think if you asked any member of my family to tell you their favorite time of year, they would, without hesitation, say summer. (And no, Emmett can't exactly verbally articulate his opinion quite yet, but I just know the little dude agrees.) The kids especially relish in everything the season brings, from playing at the park for hours to swimming at the local pool to enjoying summery treats (summertime ice cream forever!). I feel like when I look back on my own childhood, my most vivid memories take place in the summer and involve summertime family traditions. We've been trying to create our own traditions, and the most recent is probably my favorite - summertime family story night. 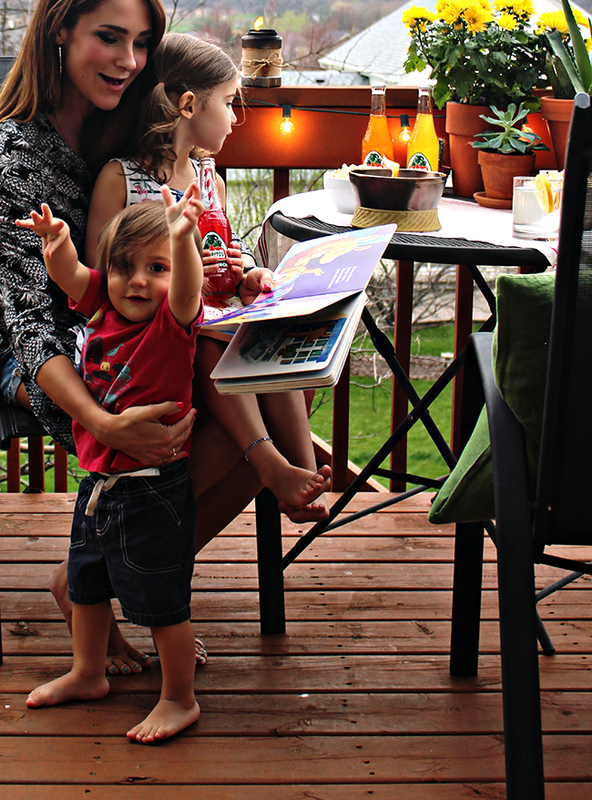 The fact that summer means getting to spend time outdoors is the absolute best, so we decided to set aside a few evenings a month to create a special "story hour" on our back deck. 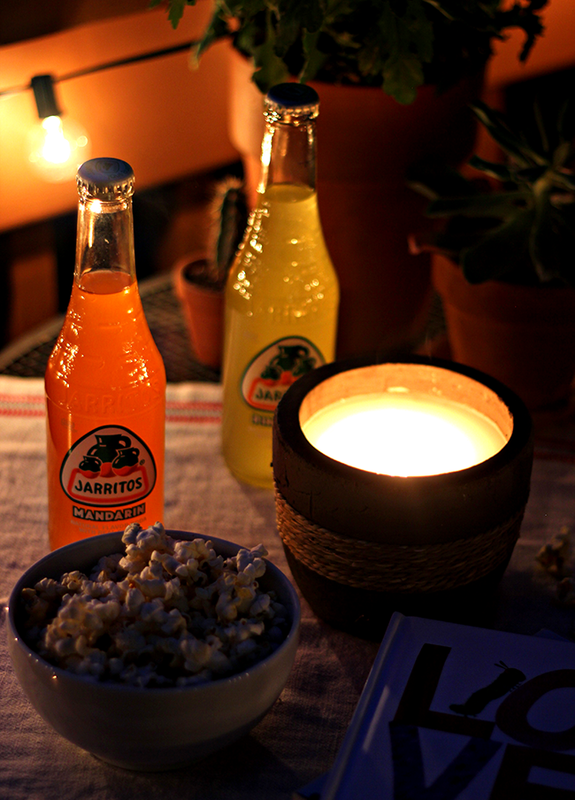 We pop some popcorn and Essley gets to choose one sweet treat (this time it was fruit soda), and we illuminate the deck with products from the TIKI Brand Clean Burn Tabletop System. The kids get to pick out a basket full of books, we leave our phones in the house, and we enjoy the evening reading the books to Essley and Emmett and just relaxing together as a family. It's such an easy way to take advantage of the summer and do something simple that ends up feeling really unique and special. You guys already know that I'm a big fan of TIKI Brand - we've been using their products to create a warm ambience in our outdoor spaces for years. 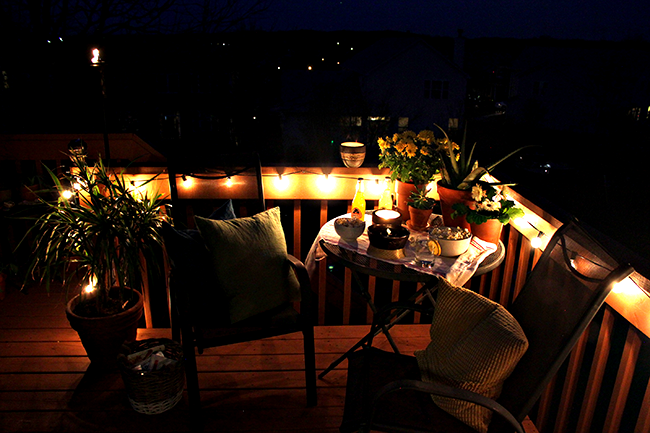 There is something wonderful about being able to walk out onto the deck, light a few products from their Clean Burn Tabletop System, and instantly transform the area into a cozy, warm little haven. When we do this for family story hour, Essley calls it "turning on the magic." And honestly, that's a pretty accurate description. While on most nights, we only choose a couple of pieces to light, on story night we light them all. Our Clean Burn Tabletop Firepiece (in Bronze Ceramic - so pretty) makes an incredible table centerpiece and feels like a mini back yard fire pit, perfect for reading stories. Because the Clean Burn Torch Fuel used in the Tabletop Firepiece (and all of the TIKI Brand Clean Burn Firepieces) burns clean (it's an 85% plant-based formula), we're able to enjoy our evening without a smoky mess. We also light our Clean Burn Tabletop Firepiece with FlameShield, our Clean Burn Tabletop Firepieces in Red Glass and Teal Glass, our Clean Burn Tabletop Firepiece in Burlap, our Urban Metal Torch (Essley says "it feels like a party!" when it's lit), and our Earth Tone Citronella Wax Candle. 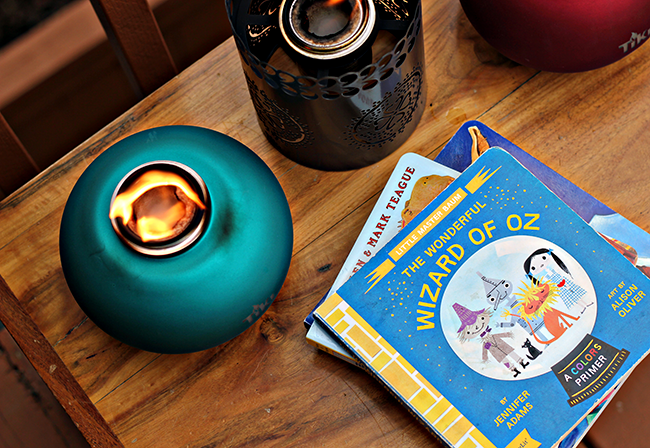 Each of the Firepieces, in conjunction with the Clean Burn Fuel, burns for 3+ hours, and the Urban Metal Torch burns up up to 5, so we're assured a full evening of story time fun. It's pretty great. It's amazing how such a simple summertime family tradition can bring so much joy. And it's also amazing how easy it is to take the event up a notch by throwing together some snacks and creating a magical ambience with a few pieces from the TIKI Brand Clean Burn System. 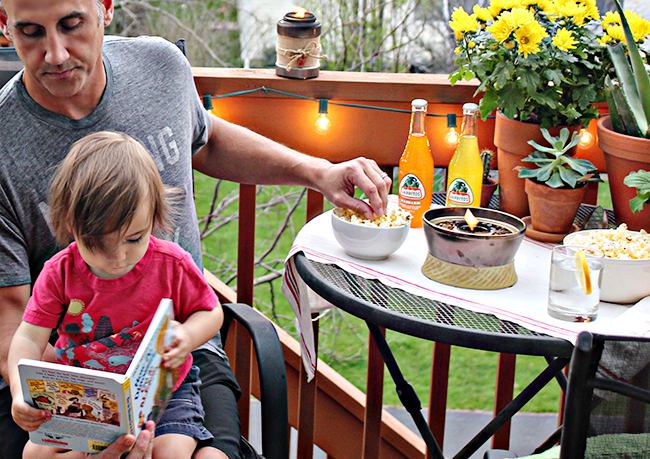 I know this is something we'll all look forward to as summer approaches every year, and that my kids will be able to look back on it in the same happy way I do the summertime family traditions of my childhood. Use code TIKI5OFFCB on tikibrand.com for $5 off when you purchase the Clean Burn Torch Fuel and a Clean Burn Firepiece. Find more info here. What summertime family traditions do you have? This post is in partnership with TIKI® Brand. All opinions are mine. Thank you for supporting the brands that help make Bubby and Bean possible. I love how TIKI brand really illuminates your outdoor space. In our new place - just a few weeks to go! - we will be very high up, so I think we'll probably have sun until quite late in the day, but just in case I'm wrong, I'll be keeping TIKI in mind. This looks so fun and is such a good idea! P.S. I love Tiki stuff!